Because you want to know How to bet on Football, we are going to show you step-by-step all you need. 2. How to understand different types of bets on Football, picking a matchup, betting odds, and football betting strategy. This is covered in our next tutorial: “How to place a bet on football”. Do you have still some questions about how to bet after reading our articles? We will help. Please send them to us here: Help me bet on Football. 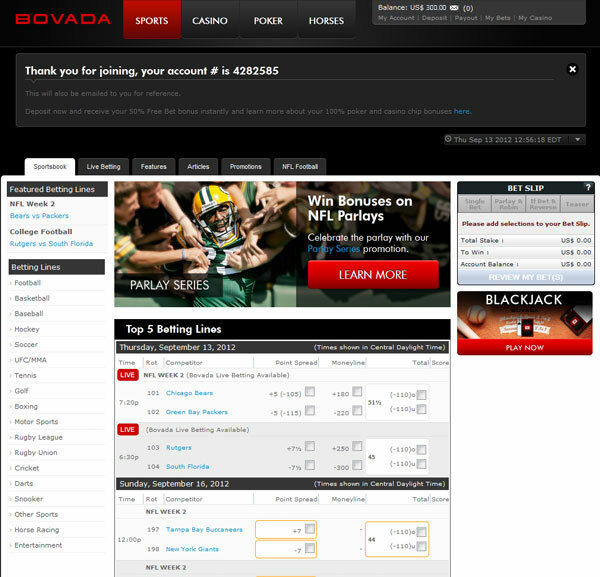 In this tutorial, we are using a popular, USA friendly online sportsbook named Bovada. If you live outside the USA, here is a list of excellent online sportsbooks. 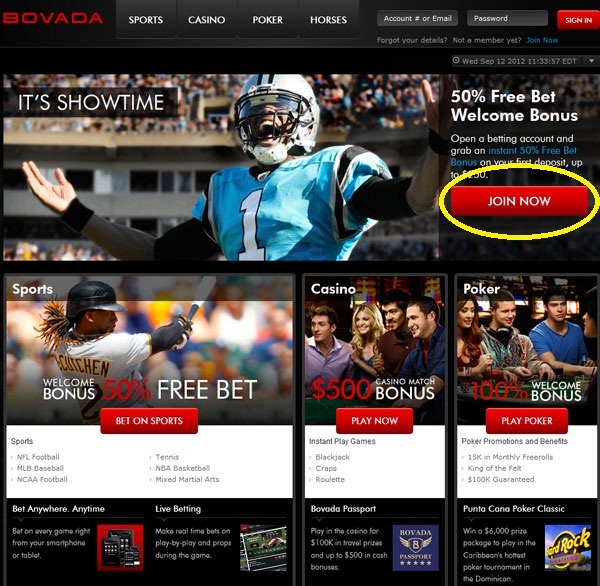 You would first simply go to the main page of Bovada.lv, and click on the “JOIN NOW” button. It can be found on the main page or can be found while you are navigating the website. 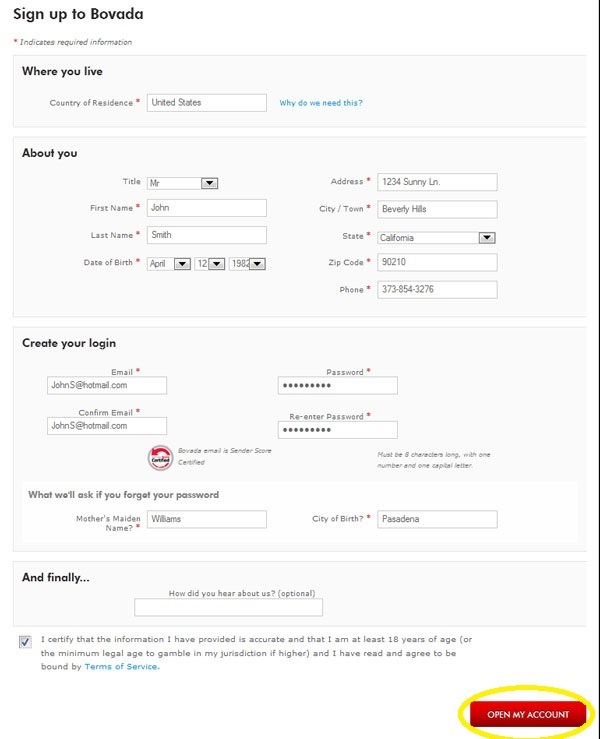 Once you have clicked on the Join Now button, the next screen is the Sign-Up Information page. During this step, you will have to fill in all of the necessary information. Required information, which cannot be left blank, are marked by an asterisk (*) and should be filled in properly and truthfully; as this information will be used when depositing and withdrawing funds from your account. The first and most important piece of information is your location; which is denoted by the Country of Residence field. This is done so that only U.S. bettors can sign up and use their services as they must adhere to strict rules put in place by the U.S. The bettor will then proceed to fill out their personal information. Depending on whether you are a female or male, you would choose Mr or Ms. Then simply input your full Name, as it will be used further along in the signing up process; so make sure it is correct. Input your Date of Birth, as Bovada needs to verify that you are indeed old enough to bet on sports. Proceed to writing in your complete Address, along with Telephone number in case they need to contact you through the telephone. Next up is inputting your Email, since this is where they will be sending you all kinds of information, including bonuses and promotions, account updates, and even in case you forget your password. You would obviously create you password during this step as well, so remember what password you chose. You need to place an answer to two security questions that will be used to confirm the bettor’s identity whenever they contact Customer Support or want to change account information. Once all of the information has been filled, and the bettor has certified that the above information is correct, they can hit the “OPEN MY ACCOUNT” button. 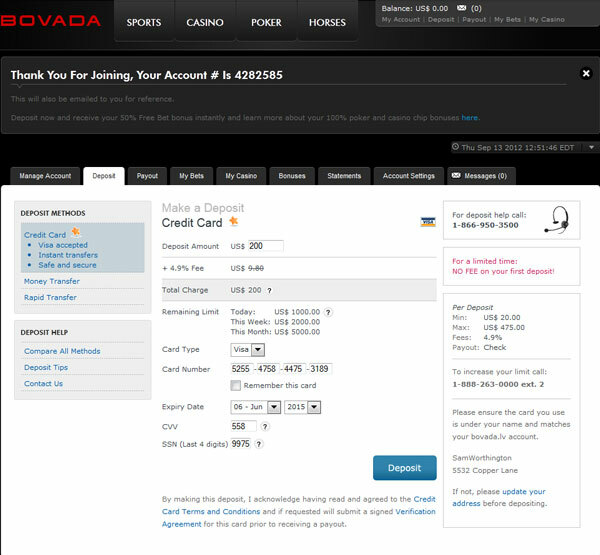 After having sent in your information, and having created your new sportsbook account, Bovada will automatically give you confirmation that your account has been successfully created. They will also be giving you a personal account number, which will be used when signing in to the sportsbook or used when contacting Customer Support in case there are any issues with your account. 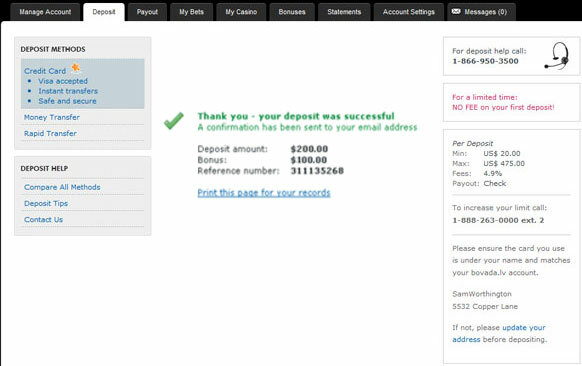 They will also be sending a confirmation email, to the email address you provided previously. Be sure to check your email, to see what great bonuses and promotions they are offering you as a new member; they will come in handy during the Depositing step. 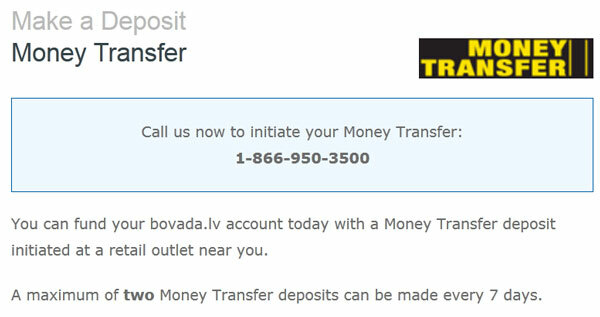 This is the most crucial step when signing up on an online sportsbook, depositing money for the first time. Most first time members will be sent automatically to the Deposit page, where they can pick from three different options when wanting to deposit funds into the account. Remember that each depositing option have a different Fees, as well as a Minimum and Maximum amount allowed, so be sure to know these limits before depositing. They have a Credit Card option, where members can use their Visa credit card to deposit funds. Input all of the appropriate information in the fields, and double-check to make sure the information is correct. Once all of the information has been input, all that is left to do is to click on the “DEPOSIT” button at the bottom of the page. *Note: the member’s credit card information must match the information that they have on file, i.e. the information they provided on the sign-up form. They will use this information in order to verify that the credit card is indeed yours. There are two more options, Money Transfer and Rapid Transfer. You would have to call the number provided in order to become eligible to deposit funds through either of the retail outlets of the Money Transfer or Rapid Transfer. IMPORTANT: If you are not automatically sent to the Deposit page, simply click on the “Deposit” link, at the top right corner of the screen. 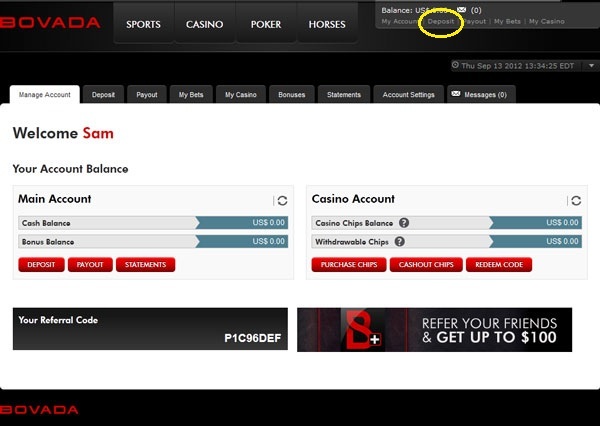 Once you have input all of the deposit information correctly, the sportsbook will confirm that the money has been deposited and that they have charged your credit card. 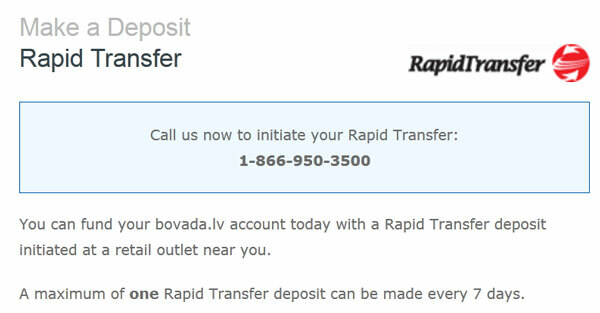 Once your first deposit has been placed, they will automatically receive the Sign-Up Bonus that the Bovada sportsbook is offering at the time. There are some rules and restrictions, so be sure to read them. The only thing left to do is start placing bets on football, so Click Here to visit the Sportsbook. To learn about types of bets, lines, strategy, we suggest you read: How to Bet on Football – part 2. If you have any questions about signing up, making deposits, getting bonuses, understanding lines, etc, we would be glad to help.